Today I found out that Welch’s Grape Juice started out as a substitute for sacramental wine. You’ve probably heard about Jesus turning water into wine, but Dr. Thomas Bramwell Welch is a lesser-known drink magician who developed a way to turn something that would have been wine into a non-alcoholic version of the drink, in an attempt to make an “unfermented sacramental wine”. Dr. Welch was a physician, a dentist and a Methodist minister in Vineland, New Jersey. At the time, Methodists were strongly opposed to the consumption of alcohol. 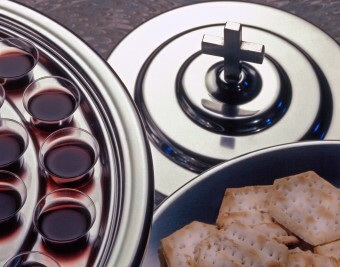 This made serving wine for communion somewhat hypocritical, a discrepancy that Welch was quick to point out. His stance on the matter was so strong that he was even opposed to touching a container holding wine—a problem, since he was the communion steward. The last straw was supposedly when a member of the church turned up at the Welch home one Sunday evening after partaking in a little too much of the communion wine. Welch was furious at the man’s raucous behaviour. So, what to do about it? Being something of a jack-of-all-trades, Welch took on the endeavour himself. He sought to come up with a way to bottle grape juice so that it wouldn’t eventually turn into wine. In 1869, he pressed juice from Concord grapes, filtered and bottled it in his own kitchen, and then used Louis Pasteur’s innovative new technique called “pasteurization.” He boiled the bottles of grape juice, which not only helped preserve the juice, but also killed all of the yeast in the bottles. This prevented fermentation, so the drinks would not be alcoholic. Needless to say, the unfermented sacramental wine did not get off to a great start. Welch was forced to set his product on the back-burner, though he remained heavily involved in the temperance movement. That said, a small amount of his grape juice continued to be produced for a few churches in the area. It wasn’t until Welch’s son, Charles, who was also a dentist, started advertising Welch’s in the 1890s that it became more popular. Now don’t think I’m trying to discourage your pushing the grape juice. It is right for you to do so, so far as you can, without interfering with your profession and your health. Thanks to the rise of the Temperance Movement, Charles’ profession was about to change. The juice’s appearance at the World Fair in Chicago didn’t hurt, either; thousands of people were able to sample it there in 1893. Welch’s soon became the natural drink substitute for wine; it was made from the same fruit and suited the taste of the Temperance Society. In 1913, Secretary of State William Jennings Bryan hosted a dinner for the visiting British ambassador; while it was traditional to serve wine, Bryan decided to serve Welch’s instead, making it more fashionable. That same year, alcohol was banned on Navy ships and Welch’s grape juice was served instead. Today, the company is a household name, featured on juice, jellies, and jams. They reportedly rake in nearly a half a billion dollars every year and have since moved their headquarters to Concord, Massachusetts, where they grow cuttings from the original Concord grape vine used. Not bad for something that started out as the result of a pet peeve of one man who simply wanted to provide a way for people to take communion without alcohol crossing their lips. During the 1500-1800s Catholic, Protestant, and even Puritans taught that alcohol was a gift from God and was created by God to be used in moderation for the pleasure of man and to aid in health. Drunkenness was viewed as a sin, as it often is even today, but it’s only been relatively recently in Christianity that drinking in general has been considered sinful. Thomas Welch was involved in the underground railroad during the Civil War, successfully smuggling several former slaves from the south to freedom. In the 1930s, Welch’s—then run by Thomas’ grandsons—distributed 10% of the company’s shares to their 300 employees as a Christmas present at the height of the Great Depression. Welch’s initial foray into the world of grape jam was in 1918 during World War I with a product called “Grapelade.” The entire first batch was snapped up by the United States Army which doled it out to soldiers. When the soldiers returned home, they demanded the delicious Grapelade as part of their breakfast. This went a long way in helping to popularize the relatively newly invented peanut butter and jelly sandwich. That wasn’t the end of Welch’s in the military. During World War II, the United States saw a shortage in Welch’s products because the government once again laid claim to them for use in the military and hospitals. Are you a fan of frozen juice concentrate? You have Welch’s to thank for that! In 1949, they introduced the first juice concentrate you stored in the freezer to make juice later with. NICE ARTICLE. BUT IT WUD B A GREAT IDEA IF ITS FOLLOWED BY NEXT ONE IN THIS SERIES AS “TODAY I FOUND OUT – THE PERFECT HOME RECIPE TO CONVERT ANY FRUIT INTO WINE AT HOME ONLY WITHOUT ANY TECHNICAL MUMBO JUMBO” WELL, I M SURE SUCH RECIPES EXIST, NOW THE ONLY THING NEEDED IS SOMEONE GAME ENUFF TO PRODUCE THEM HERE. I M SURE EMILY WILL OBLIGE. TNX IN ADVANCE. As a ruling elder who prepared Presbyterian communion with Welch’s, I wanted to pass on one protestant explanation of the water into wine miracle. Supposedly “new wine” was how the Romans referred to unfermented wine (i.e. grape juice) and this is what Jesus created at Cana and this is why protestants use grape juice at communion. Riiiiight. As far as making wine, all you need to do is buy wine yeast (available at Amazon, of course). The directions are on the package. I believe that Dr. Thomas Bramwell Welch is a descendent of William Booth who founded the Salvation Army. The Salvation Army has, since its beginning, had a mission to reform alcoholics and to help them to conquer alcoholism. Hence his mission to find a non-alcoholic communion option. I am a born again Christian, and have been a member of churches who used wine or grape juice. and not until about 5 years ago, after I entered into a study on the subject of what was the proper element to use in the Lord’s Supper, did I come to have real peace about this matter. I entered into this study with an open mind, and willing to look at both sides of the issue. Using the Holy Scriptures as my main guide & authority, but also using historical facts & the good common sense that God had given me. After studying on this for about 5years I have come to believe, that the evidence I see supports the use of fermented wine.. Historically we see that churches used wine for approx. eighteen hundreds years, so my question is this. why would I want to believe something that started through a Humanist Movement like the Temperance over what our forefathers used & had no problem believing it was what the Lord Jesus Christ used when he gave this to the First Church. I could say much more & give many scriptures to support my stand on this issue, but time & space will not allow at this time. Just so we understand, Christ Jesus would not place a stumbling block before any human being. The hebrews terms for wine very from non alcoholic grape juice to horrid tasting alcohol juice. Don’t kid yourself study a little bit of hebrew, which you will find that the term grape juice didn’t come into speech till Welchs started manufacturering it in the USA and labeled it as grape juice. Figure it out for yourself, get educated. An extension of your study might be to look into the reasons for the invention and use of individual communion cups. Since the Churches of Christ came out of Presbyterianism and not Methodism, the continued to use fermented wine long after the Methodists outlawed it. They also continued the use of one cup long after the Presbyterians invented and put individual cups into general use. The Presbyterians promoted individual cups because, having more doctors, they accepted the “germ theory”. David Lipscomb, among other CofC preachers, rejected the germ theory. Lipscomb wrote an article in the Gospel Advocate ridiculing the idea that disease might be caused by “tiny invisible animals” in the wine or on the cup (I have not been able to find my copy, but it can be found in an old GA issue). I do, however, have two of the earliest sets of individual cups produced by Presbyterians (one with wooden trays from Canada, and one with aluminum trays from Pennsylvania). Matt. 18:6 states that if we cause anyone of these little ones , who believe in the Lord to stumble, it would be better for a millstone to be tied around their neck etc. If we state that anyone who drinks anything alcoholic is a sinner and cannot be a member of the church, that places us in that former group. How can we be members of the Churches of Christ and not place ourselves into that former group of the condemned by our Lord? The challenges faced with many Churches,Methodist Church inclusive who serve sacrament with Communion wine with alcohol content is for example the indulgence of members of such churches in indiscrminate alcohol consumption in the neighbourhood on Sundays after divine service till late.The Key mission of the Church is to preach tbe Gospel of Christ for the salvation of souls.Decorum is often a requirement for effective preaching of the gospel.The intoxicating effect of alcohol consumption on the cosumer often negates the usefulness of such a onein the Kingdom and puts a label on such churches as not serious or focused.While I do not subscribe to the idea that alcohol consumption is sinful,the moral justification of any church hierarchy to preach against drunkenness and misbehaviours associated with drunkeness ,may be called to question when fermented Communion wine with alcohol content is served at sacrament as observed by Thomas Welch.This is a sincere food for thought.